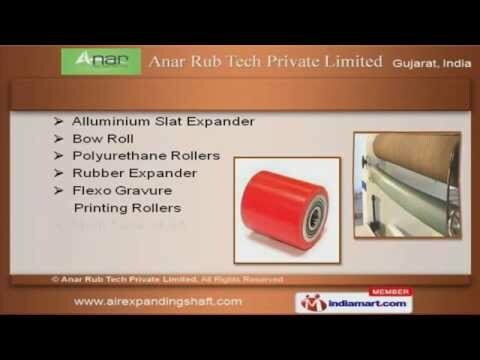 Welcome to Anar Rub Tech Private LimitedManufacturer & Exporter of Industrial RubberWe are an ISO certified company, incepted in 1978, at Ahmedabad. Our Largeproduction capacity & stringent quality test help us to cater Europe & America. Cost-effective prices, Experienced & expert manpower make us the first choice of ourclients. We offer a wide assortment of P U Rollers, Safety Chuck & Wrinkle Removers. Our Air Expanding Shaft, Rubber & Banana Rollers are available at industry leadingprices. Bow Roll, Rubber Expander & Multi Tube Shaft offered by us are in huge demandacross the global markets. Our Quick Locks, Air Chuck & Textile Expander are a class apart. We also provide Multi Bladder Chuck, Ball Lock Shaft & Metallic Bow Rolls that arehighly efficient. Along with that we offer Rubber Blanket, Silicon & Conveyor Rollers that are costeffective.